The seventh entry to the number one selling multiplatform game of all time will arrive on November 9th, 2010. Like most of us this is our most anticipated game of the year. This version will remain the same with a few added tweaks to make the experience more enjoyable. This version will include more kill streak rewards such as a remote control car. You will be able to customize characters and weapons, cash will also be given out at the end of matches as well as the point system the game employed previously. The cash that is won not only can be used to purchase upgrades and new weapons, but can also be used in the new wager match feature where the top three players earn what was put in the pot. The cash option is great because it lets you purchase weapons of your choosing instead of earning ones you would probably never have used at all. Different match options are also a new additive addition to the game. Some of the matches include Gun Game, One in the chamber, and sticks and stones. Players also have the option of playing bots online before getting pummeled in multiplayer. 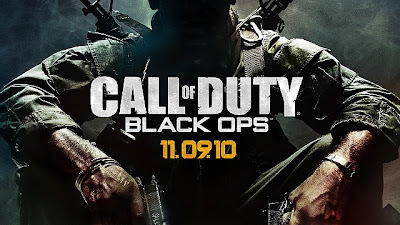 Treyarch/Activision has also included Black Ops theatre which allows matches to be recorded and clips can be shared with other players online you’re your lucky enough to own a 3-D TV, Black Ops was recently tested on this platform and based on online reviews the experience was phenomenal. Modern Warfare 2 has already generated one billion plus in revenues. Will Black Ops live up to the hype? With the options and customizations that will be available I believe it may smash Modern Warfare 2’s record. Check out the live action trailer for the game below. An excellent trailer is attached below displaying the true element of Call of Duty…. 1st person shooters are overrated. they are all the same game over and over again. The commercial might end up being the best part of this game. Try Farcry 3 Pedro I think you would like it.